I've been meaning to make a card for this month's Creating Pretty Cards sketch challenge, but it just kept slipping to the bottom of my list for various reasons. 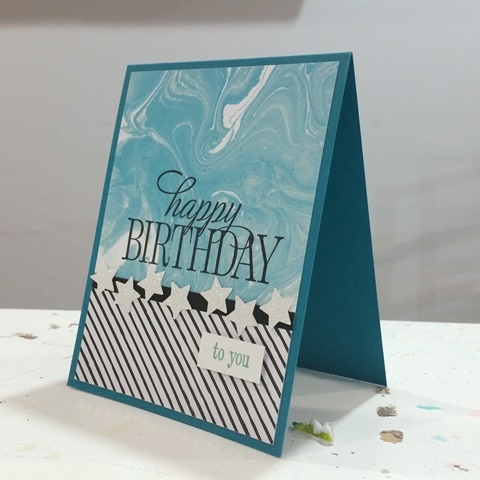 Last night I finally had a chance to go into my craft room just to play for a few minutes and used some scraps on my table to whip up this easy and sweet birthday card. Island Indigo cardstock 4-1/4" x 11", scored at 5-1/2"
Perfectly Artistic DSP 4" x 5-1/4"
Go Wild DSP 1-1/2" x 4"
Basic Black cardstock 1/4" x 4"
Whisper White cardstock 1/2" x 1-1/8"
I started off by folding the Island Indigo cardstock on the score line. Next I used some glue stick to adhere the striped Go Wild DSP onto the Perfectly Artistic DSP. Then I stamped the greeting onto the DSP in Jet Black Stazon ink. Next I used glue stick to adhere this layer onto the card front. Then I stuck down the 1/4" wide Basic Black cardstock strip with 2-Way Glue Pen. 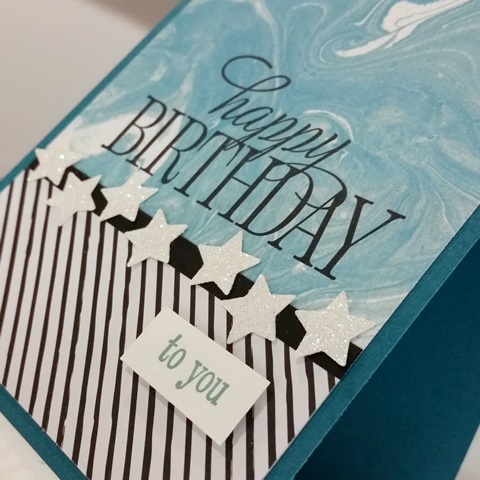 I used the star punch from the Itty Bitty Accents Punch Pack to punch seven stars from Dazzling Diamonds Glimmer Paper. Each star was glued in place with a small dot of Multipurpose Liquid Glue. 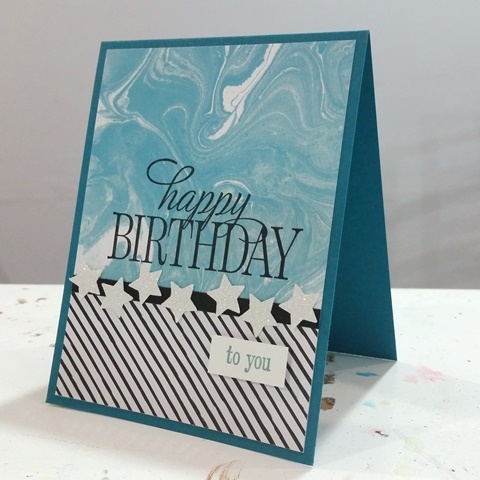 Lastly I stamped the small greeting onto the piece of Whisper White cardstock and stuck it onto the card front with a couple Stampin' Dimensionals. This was a super fast and super fun birthday card to make. It's always nice to get a few minutes just to play around for fun.